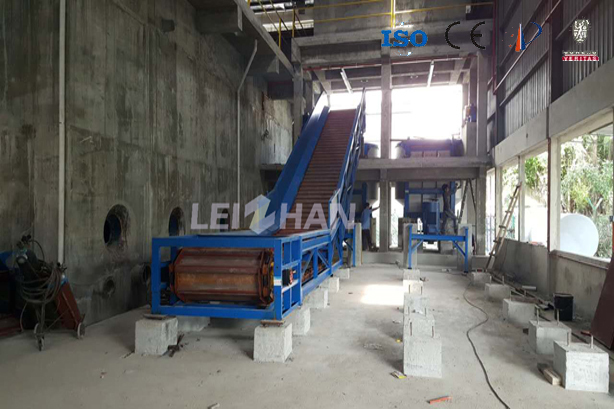 In July 2016, Leizhan Paper Machine Company provides three chains conveyor for our Malaysian customer used in paper egg tray line. They already has a paper-making mill, and need to upgrade their conveyor equipment. After a long time searching and inspecting, they finally decides to use Leizhan’s equipment. They come to our factory and choose BFW Series Chain Conveyor. BFW Series Chain Conveyor is a golden machine in Leizhan company. Malaysia customer requests three chains: the first one’s feeding capacity is 40t/d, the left two ones are 80t/d. It operates steadily and reliably with low friction and low power consumption. Chain conveyor is the very first step for pulping line, so a good-quality equipment is important. Leizhan’s BFW Series Chain Conveyor adopts special made chain drive one-time impact stamping, trough plate to convey material. It has the advantage of large capacity, low motor power, less wear, reliable operation and high efficiency. And it can meet your need very well. For the best usage effect, the chain conveyor can be worked with other paper machine together. For example, in the pulping process, screening machine and pulper equipment are also needed, and can increasing raise the working efficiency.Leizhan company produces the whole chain paper machine and can offer you a one-stop service.